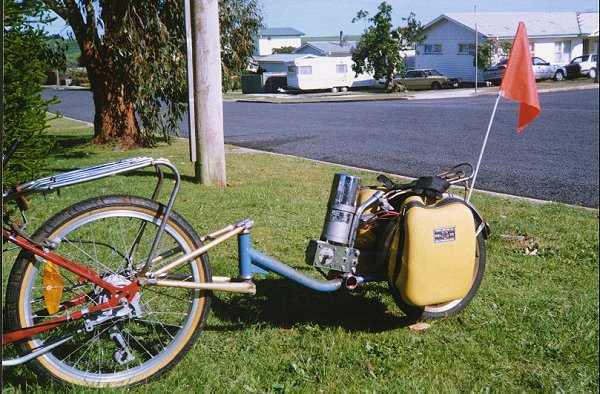 After electrifying my Long Wheel Base Delta Trike and finding it not so successful because it was a little underpowered I thought I'd go and double the voltage, placing this time the weight on a trailer instead of the trike. 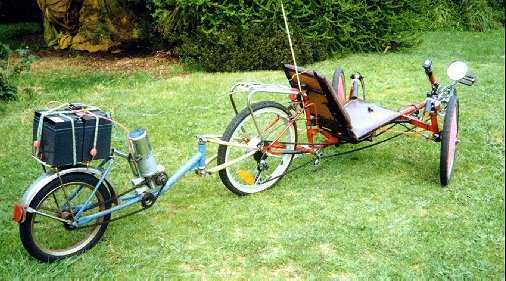 I've had a go at a trailer before but it was for my child to pedal behind me and to be honest wasn't so successful. A single track trailer I figured should be lighter than a dual wheel one. With the enormous weight I am having it carry this would probably be best with 2 wheels for stability but we'll see how it goes. As you may be able to see in the photo's it is still in the building/testing stages but it is close to what I'm looking for. 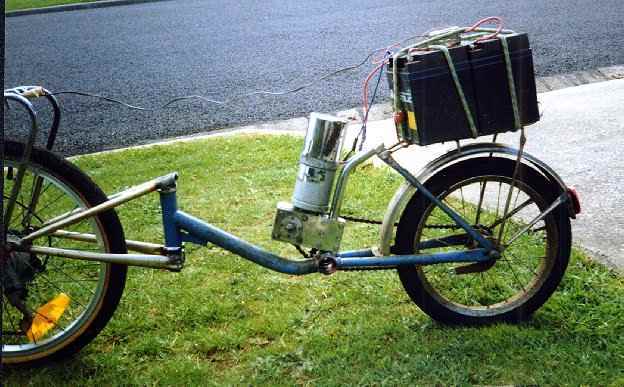 The batteries are now inside soft panniers slung over the carrier of the trailer. This lowers the centre of gravity considerably: having the batteries where you see them in the pictures made the trailer quite unstable and I don't think it would be able to handle side loads very well. As I hope to be able to use this in a 2 wheeler as well as the trikes I decided on a vertical pivot. Tilting the pivot forward makes the trailer lean into the corner, not a bad option if it was only on the trikes but I wasn't sure how it would affect the bike. That pivot is just a normal bike fork assembly. 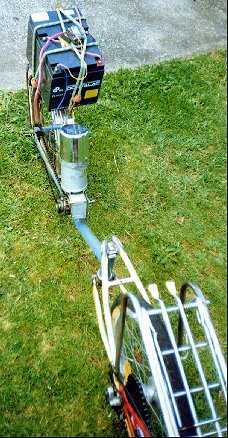 The triangular tow mount is made from an old bike rear with the top bar removable so the steering head can be serviced. It needs to pivot up and down at it's mount on the tow machines frame and I expect to do this in the future with steering ball joints. 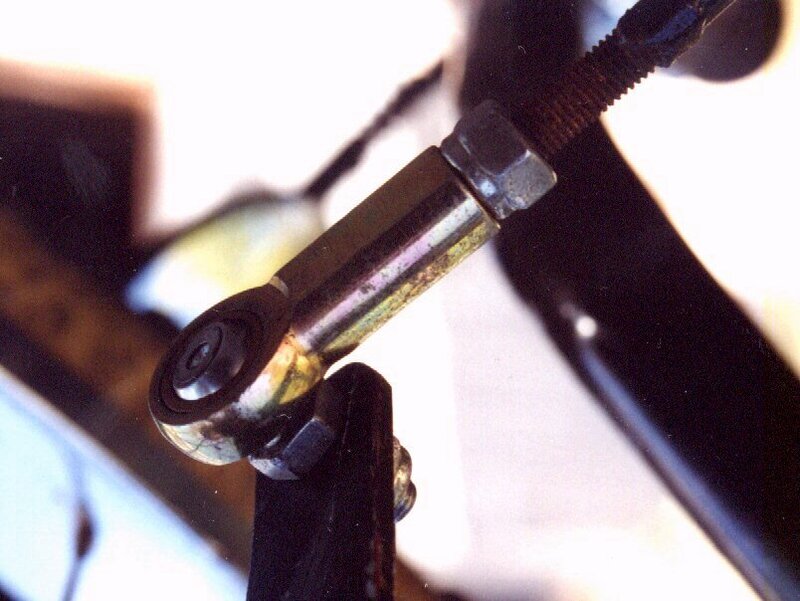 See this one used on trike steering. At the moment it's just pivoting on the bolts holding on the carrier so isn't a permanent option. There needs to be some way of holding down the bottom path of the chain so it doesn't rub the right fork so this was made with a bolt welded to a BB cone and a skate wheel bolted on that. The pics show my first attempt using a freewheel cog but it was too hard to get the chain in exact alignment. The rear coaster wheel isn't the best choice for this I figure. My hope was this would allow me to push it all backwards if needed but it doesn't allow this. What I've found is on a normal bike with a coaster wheel you automatically pedal back just a slight amount to let it release and freewheel but this setup doesn't allow that because of the motor/gearbox. What would possibly be best is a 3 or 5 speed internal hub which would give gearing as well as a possible neutral. (The Sturmey and Archer has a 'false' neutral I believe) I might be able to incorporate in the final wiring a 'flash' reverse to unlock the coaster hub. Dimensions - Motor 80 mm DIA, Length 190 mm + Gearbox an extra 90mm. Below is some Information about the motor from a very helpful (and patient) Power Assist mailing list subscriber. At 12V, it's not worth a cracker. At 24V it's useable as a low-power assist, but not nearly as good as the FRACMO brand wheelchair motor that Allan Leigh used. The continuous dissipation would be around 50W, so continuous power rating (24V) is around 130W. Intermittently, it could be used up to 250W but beyond that the efficiency is just too dismal. 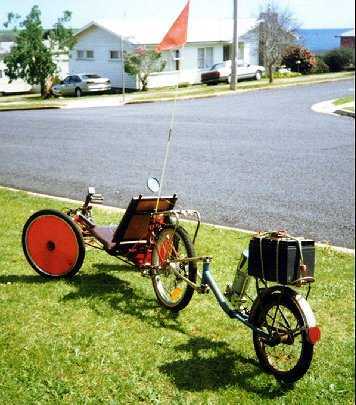 For another using an ex wheel chair motor/gearbox see Alan Leigh's Web page. Not a lot different to the pics above except the addition of battery soft cases and a small flag. This has made it much more stable but I'm not sure the panniers are going to hold up with support at the bottom.